When we think of dreamy beach days we often imagine pearly white or golden sands. 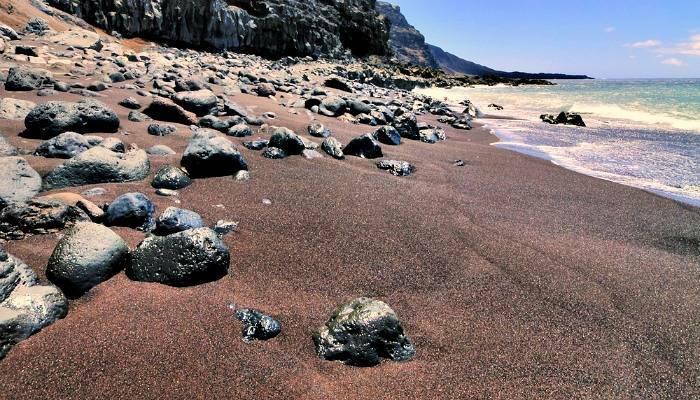 However, there are a whole host of black sand beaches in the nearby Canary Islands which are equally impressive, and offer an interesting alternative to our stereotypical vision of the beach. Plus, they come with a whole host of added extras such as otherworldly lagoons, mystical caves, volcanic rocks and secluded coves. 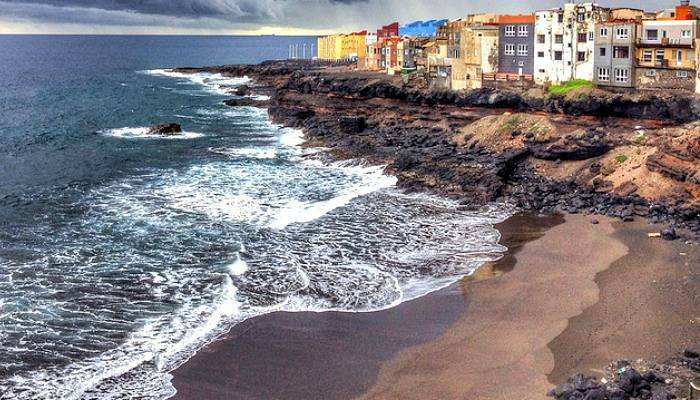 We’ve put together seven of the best black sand Canary Island beaches – and judging by the photos, you may be inclined to dust off that suitcase and get your swimwear ready! 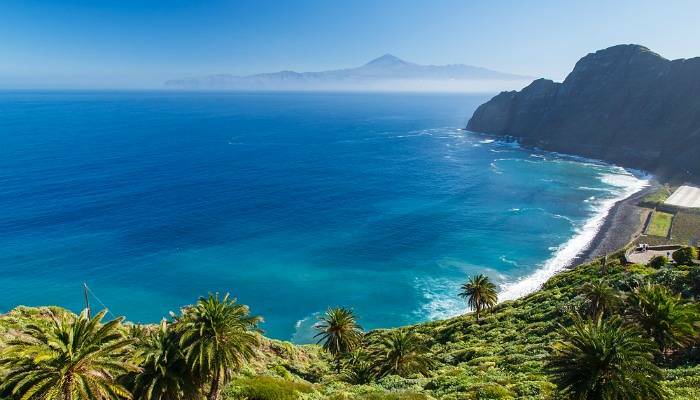 Located in the north of the less-known Canary Island La Gomera, which is home to a craggy volcanic landscape and plentiful hiking trails, Santa Catalina Beach stretches 850 metres and offers equally dramatic scenery. The largest beach in the area, it boasts grainy black sand that leads out to cobalt blue waters with stark mountains that frame the image. It’s this unique scenery and the sense of remoteness that makes it addictive, and offers up fantastic photo opportunities. 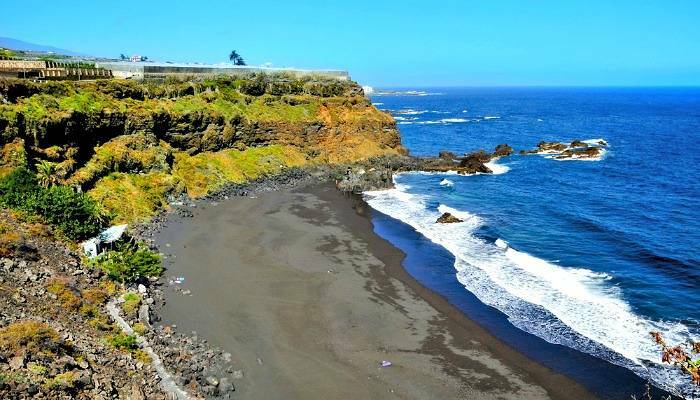 This low-key black sand beach packs a punch when it comes to scenery, and is located a short drive east of the popular resort of Puerto de la Cruz in the north of Tenerife. Alternatively, hikers can reach the beach via an exotic 45-minute amble through banana plantations and along cliff fronts. Backed by volcanic rocks, the beach had a secluded feel with clear water and soft, black sand, that makes for a soothing day at the beach for those looking to escape the crowds. 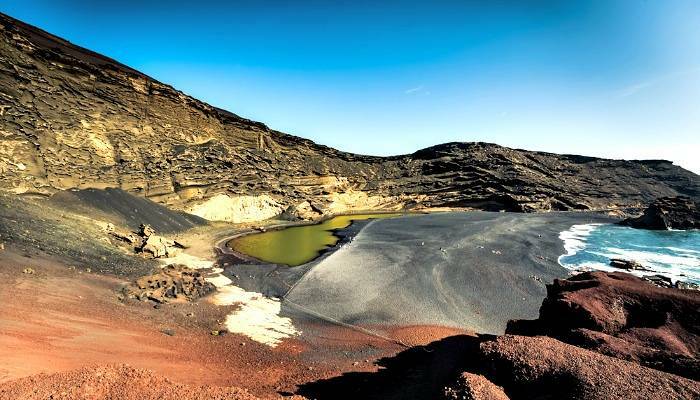 El Golfo is the famous for its otherworldly Green Lagoon – an unusual phenomenon in the cove, where sea water has become trapped and turned a striking acidic green, due to the algae which thrives there. There’s also bright splashes of auburn rocks that conceal secluded volcanic beaches, adorned with black sand. Inland you’ll find an endearing small fishing village renowned for fantastically fresh seafood served at friendly local restaurants. The island of La Palma makes a great choice for holidaymakers looking to escape the signs of mass-tourism and enjoy pretty island scenery with plenty of space, low-rise buildings and untouched wide-open stretches of countryside. 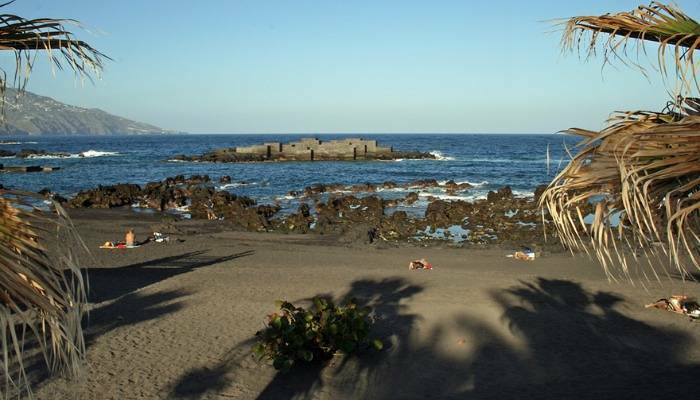 On the east coast, the black sand Blue Flag beach resort of Los Cancajos sits between the airport and the capital city, Santa Cruz de la Palma. Consisting of three black sand bays, the beach is the most popular resort in La Palma, but still feels remote in comparison to other Canary Island beaches. A short stroll away from the sand you’ll find friendly bars, local shops and relaxed tapas restaurants. Located just over an hour’s drive from Corralejo, the small village of Ajuy sits within the stunning natural landscape of Parque Rural de Betancuria. The coastline offers tranquil scenery away from other beach-seeking tourists, and the craggy surrounds and turquoise water add to the soothing scenery. Inland, the town boasts further attractions with a plethora of caves, magnificent yet affordable waterfront restaurants and whitewashed villages. This small and quiet beach in Teide feels a world away from some of Gran Canaria‘s more popular beach spots, and comes with plenty of silky-soft black sand. Popular with locals, the resort boasts an array of popular fish restaurants and you can spot lounging lizards dotted around the area. 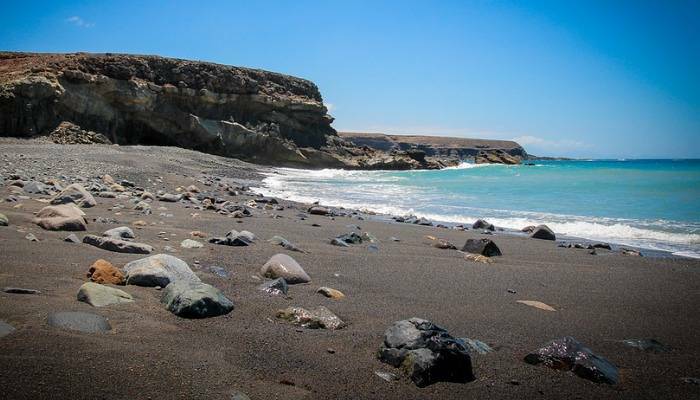 Best of all, the serene beach leads to the famous Bufadero de la Garita blowhole – get your camera ready! The remote and little visited El Hierro is the smallest and furthest southwest of the Canary Islands. A great choice for adventurous visitors, the island offers a relaxed and simple slice of life. Playa del Verodal beach is off the beaten track, around a half mile walk from the main road (Carretera La Montana) and lucky visitors often get to have the whole beach to themselves! Surrounded by a craggy coast, lava-sculpted rocks and dark sand tinted a shade of red, it’s a beautiful spot for those seeking out hidden beaches. You can reach El Hierro by internal plane from Tenerife’s main airports or by ferry (two and a half hours) from Los Cristianos.